In Charlotte, we’ve always been great at Southern cooking. Deep-fried chicken? Yup. BBQ? You bet. But now, we’ve broadened our horizons and gotten really good at other stuff, too — like plant-based cooking. 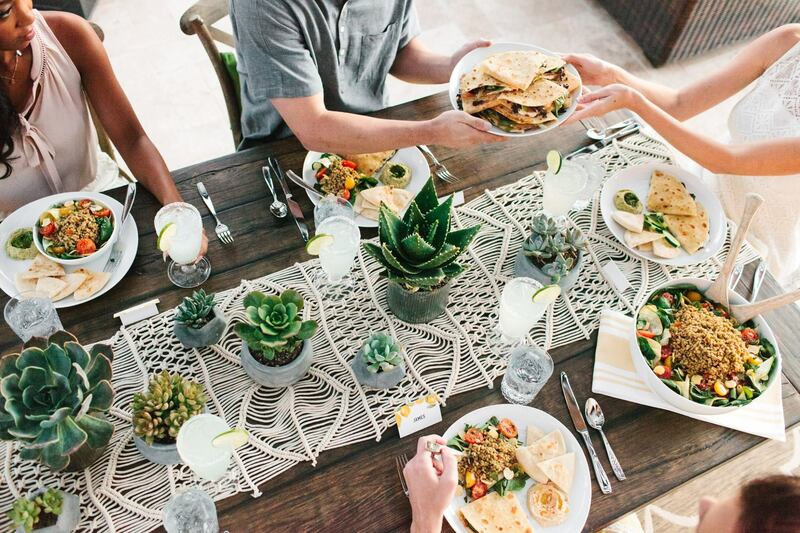 Yes, these days you can walk into practically any restaurant and find an array of healthy, green, and nutritious options to make it through a dinner with your friends. But if you’re looking for the “it spots”—places that take things even further than just one option for vegans and veg-heads—we’ve got you covered. It’s all salad, all the time at Chopt. Stop by any of their three locations in the Park Road Shopping Center, Blakeney Village, or the Arboretum Shopping Center for creative and crave-worthy greens. But before you go, it’s time to get out of your head that a salad can’t be a filling meal. 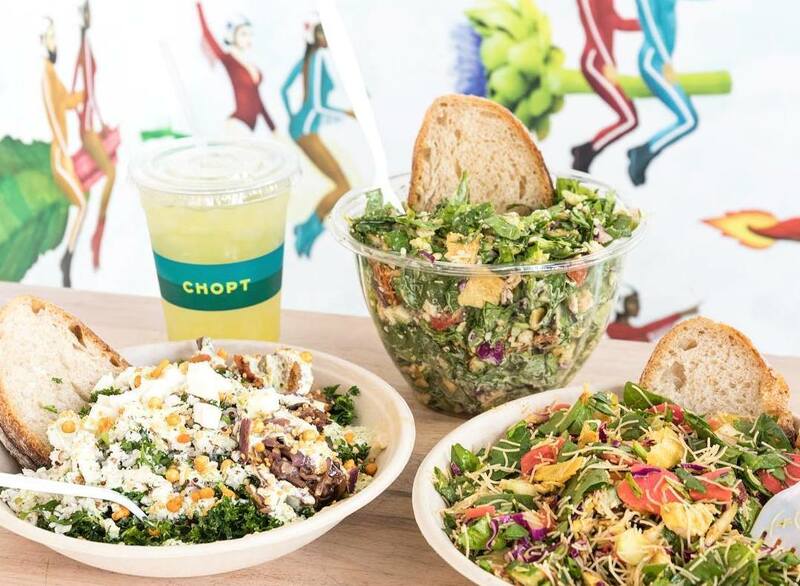 Chopt delivers any salad you can imagine in large portion sizes fit for a king (or queen). 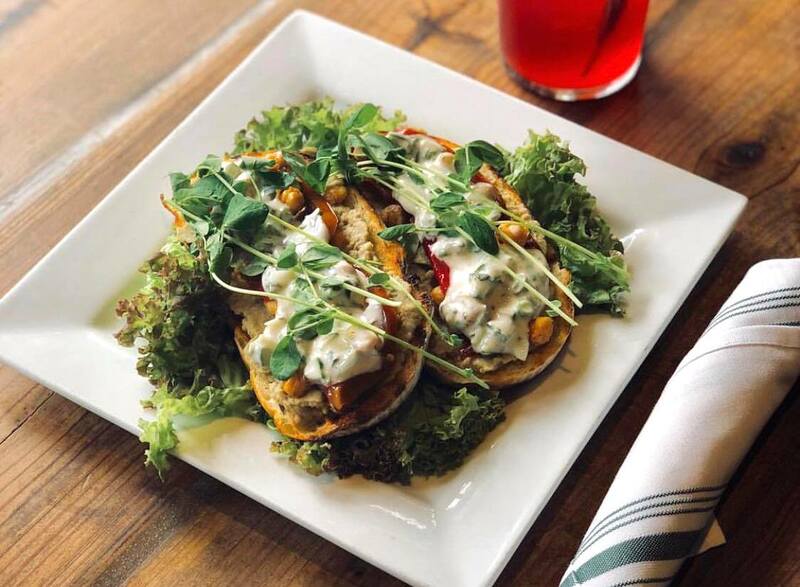 Now craving: the Mexicali Vegan, complete with avocado and Mexican Goddess dressing. In the mood for fresh, Mediterranean cuisine? Look no further than Zoës Kitchen. With seven spots in Charlotte, there’s no reason to pass up a trip to this fast casual. 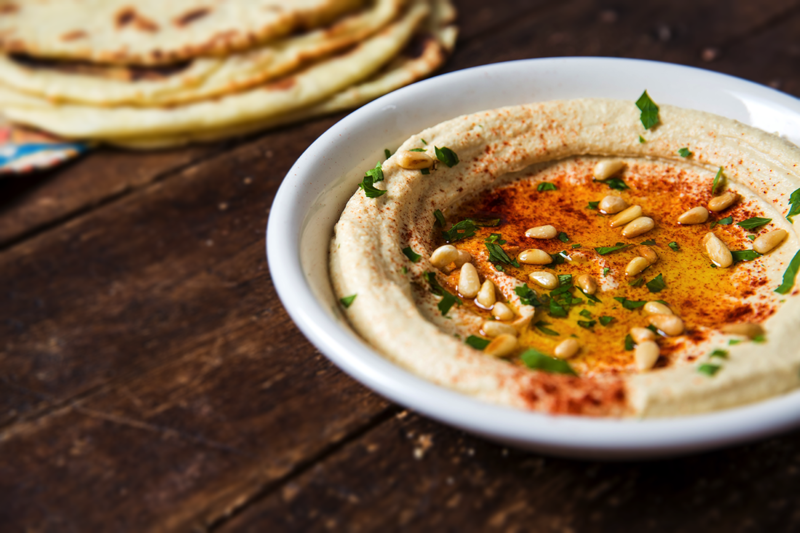 Just make sure you order hummus — we recommend starting with the Hummus Trio appetizer so you can try all the flavors. Can’t decide on an entrée? Order the Pick Two for a combo plate featuring two of your favorites. In need of a post-workout refuel after finishing your Yoga on Tap flow at one of South End’s many breweries? Try Living Kitchen. Even if you’re the proudest carnivore, there’s no denying the deliciousness of the vegan and veg-friendly plates they’re cranking out. From breakfast to dessert (vegan cheesecake, anyone? 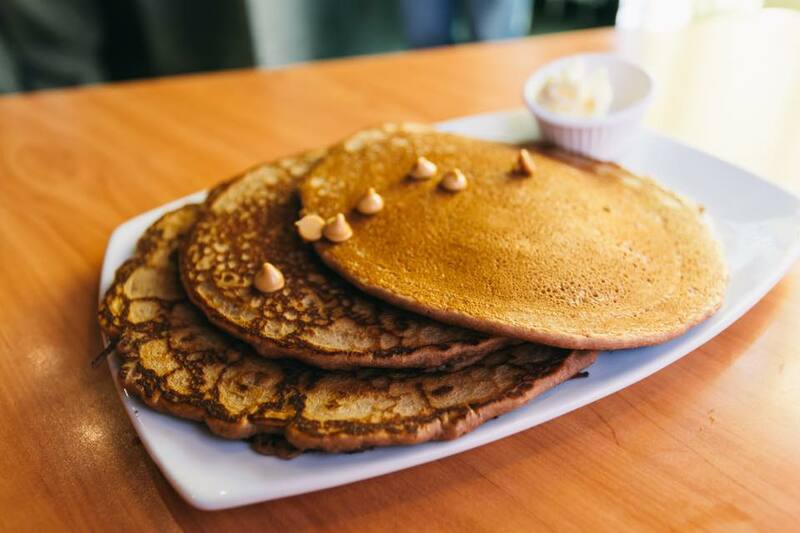 ), Living Kitchen’s commitment to providing plant-based options is undeniable. Try the Living Burrito — your stomach will thank you. Need a break from the typical plant-based fare you’re used to? 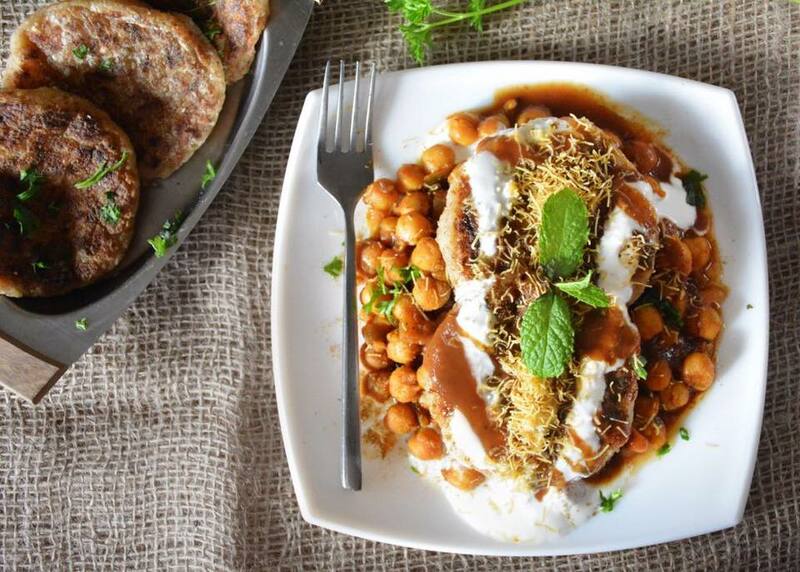 Madras Café serves the University area delicious Indian cuisine that is all plant-based and all affordable. Plus, you’ll get dinner and a show — all of the food is finely spiced with extremely rich flavors and prepared in an open kitchen right in front of you! 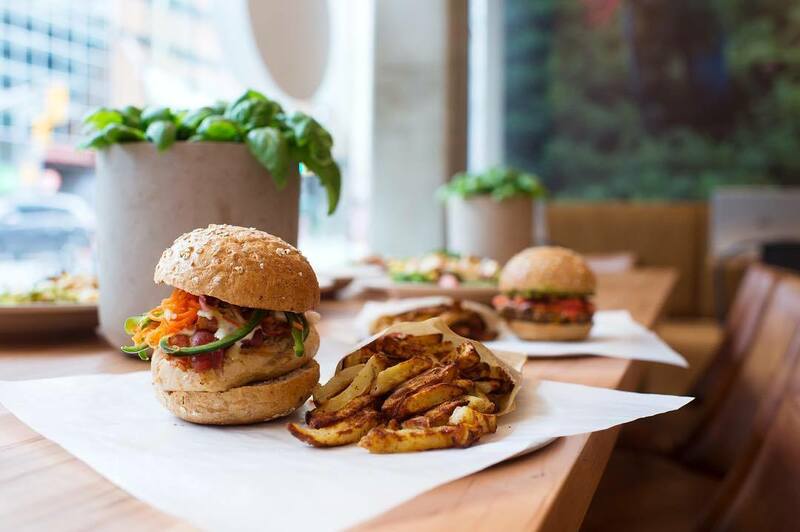 Thanks to Yafo, it’s never been easier (or more delicious) to go meat-free. 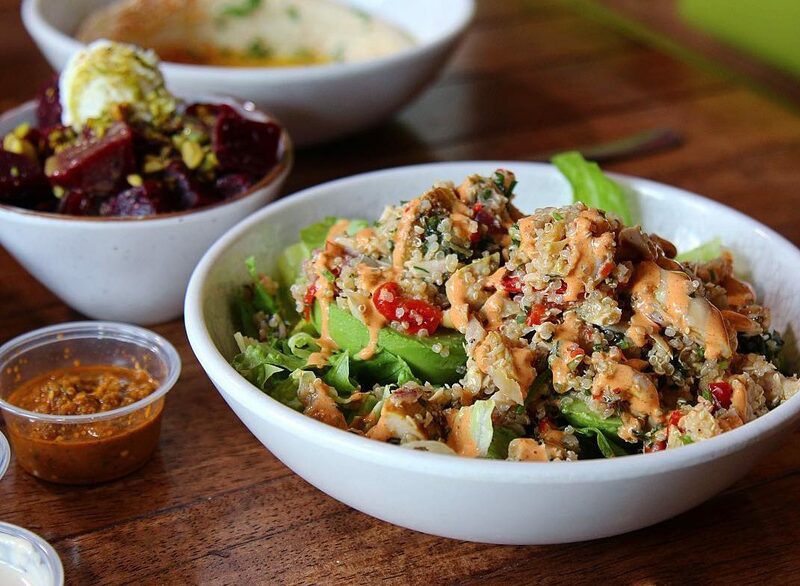 This fast-casual hot spot in SouthPark, Dilworth, and Plaza Midwood serves up a taste of the Mediterranean, with fresh hummus bowls, falafel, and more! Picky? The staff is more than willing to let you try a menu item before you order — although, finding something you like here won’t be a challenge. In the heart of Plaza Midwood sits this quaint cafe that may look a little out of place in a city that is over 100 miles away from the ocean. The beachfront-themed neighborhood haunt welcomes you with outdoor shuffleboard courts, but step inside, and aromas of fresh coffee, baked goods, and other fine fodder will have all of your senses tingling. Fitt Tip: parking is a little tight, so if you’re trying to get a weekend bite to eat, make sure to head out early or take an Uber! 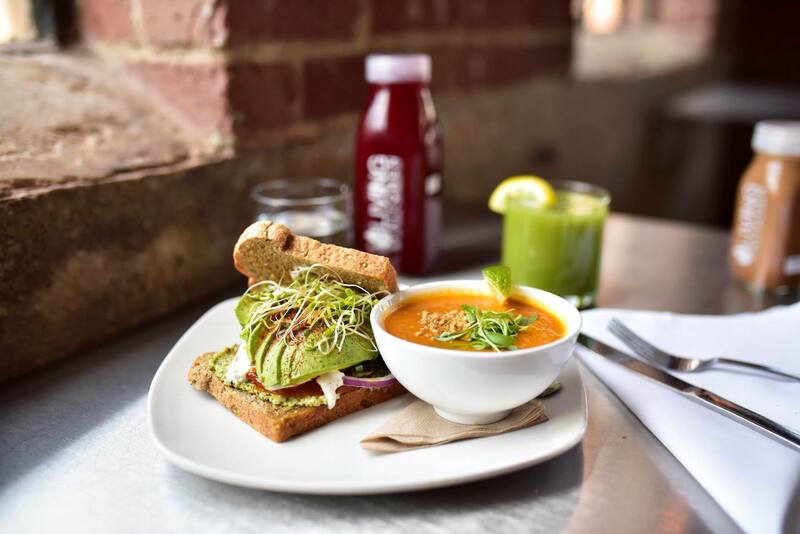 This trendy, plant-based restaurant in Dilworth embodies everything we look for: healthy options delivered by a renowned executive chef made with ingredients that are both fresh and local. Not only is the food delicious, but the decor and presentation are unrivaled. Abundant windows let in natural light that shines on the upcycled interior — barn wood serving as tables and mason jars hanging as chandeliers. And of course, fern plants are found throughout the restaurant under the twinkling lights. Typically, finding a ma-and-pa store isn’t the easiest thing to do in the middle of Dilworth. 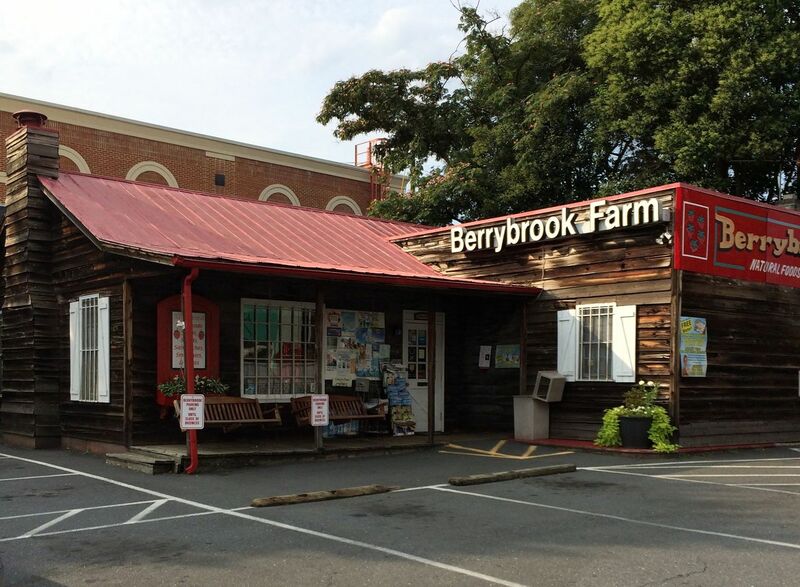 But Berrybrook Farm sticks to its roots (quite literally, if we’re talking their juices) and offers some of Charlotte’s freshest and healthiest smoothies. They also offer vegan soups and sandwiches, but be warned — there is no seating inside. 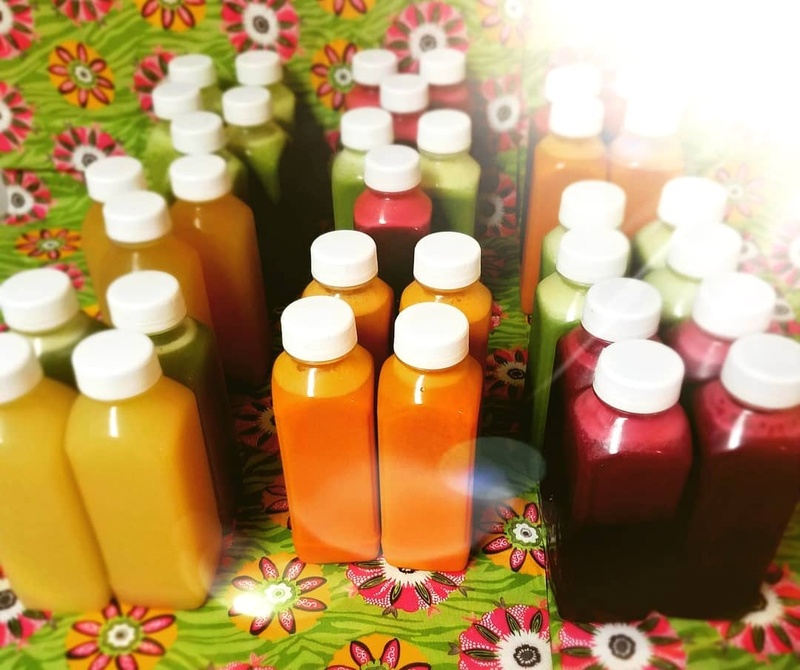 Fitt Tip: if you’re health junkie like we are, Berrybrook also offers a host of other good-for-you products from alkaline and ionized water to natural vitamins, supplements, and beauty products. 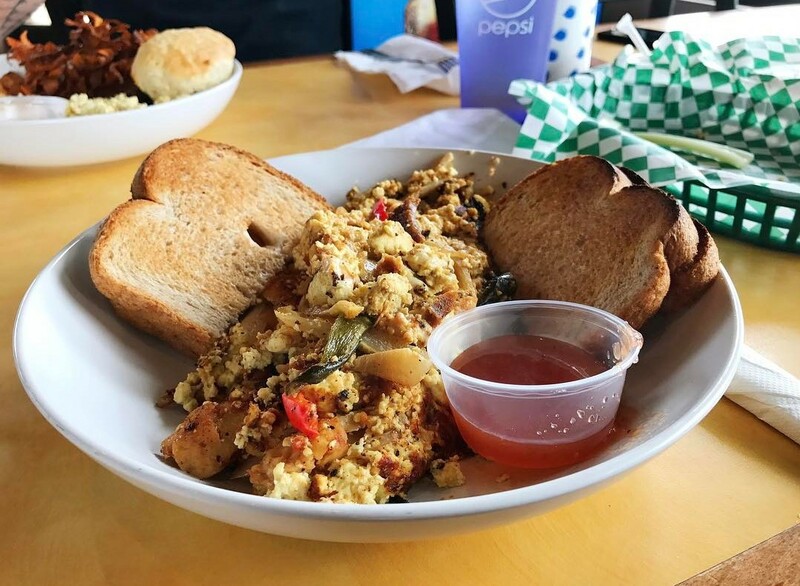 The literal definition of a hole-in-the-wall, EBN’s on Commercial Ave. serves Caribbean vegan cuisine with a plethora of healthy drink options to boot! The menu is ever-changing but everything is guaranteed to be fresh, healthy, and delicious! 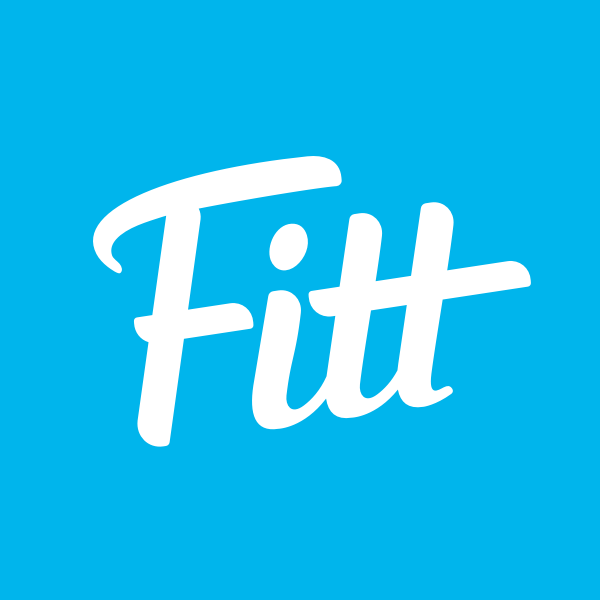 Fitt Tip: call ahead for hours; the owner travels a lot. There’s no reason to miss out on the classic Southern dishes you grew up with just because you switched to a vegan diet. And Bean Vegan Cuisine gets it. That’s why they offer a seriously creative menu with everything from pulled BBQ sandwiches (vegan) to old-fashioned meatloaf (again, vegan). Consider this the place where all your plant-based comfort food dreams come true. If you have a craving for Asian food, you’re in luck. 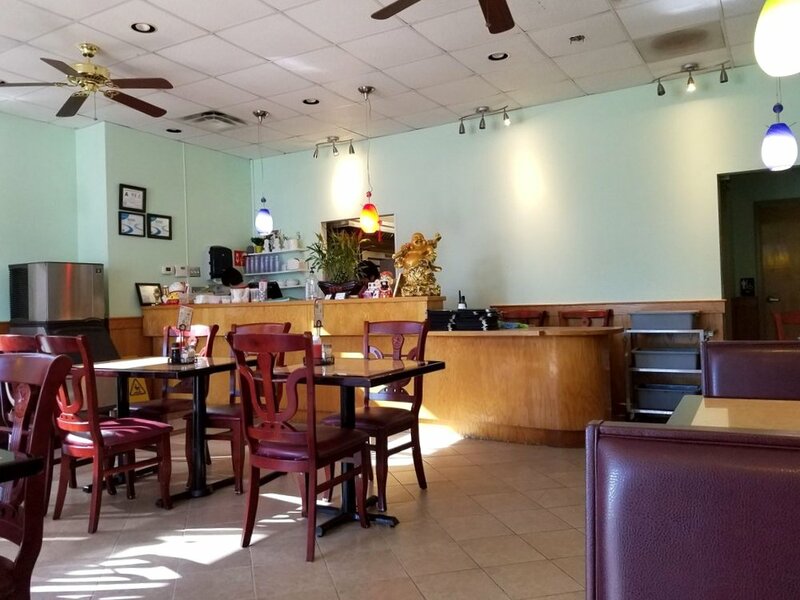 Ma Ma Wok on Elm St. serves up traditional Asian cuisine that is all vegetarian! They’ve created delicious, vegetarian versions of the classics like General Tso’s Chicken, Kung Pao Beef, and Sweet and Sour Shrimp. The menu is huge, though, so it may take you more than a few minutes to decide what to order. 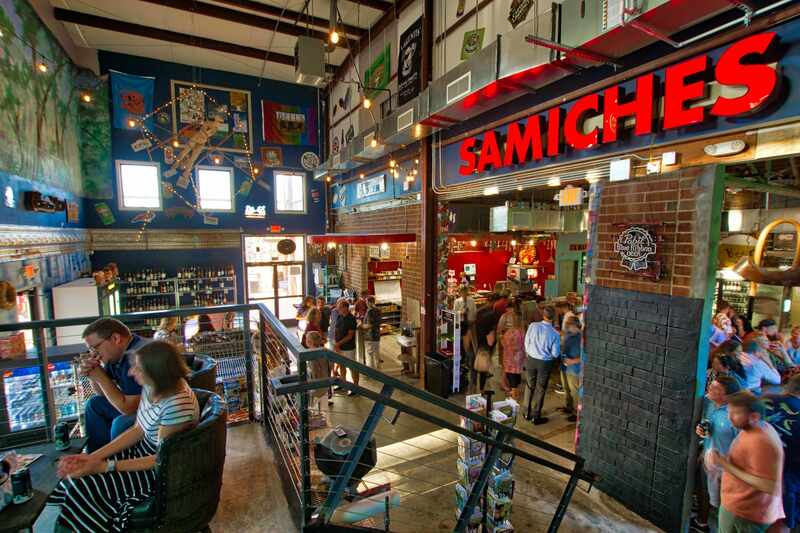 There’s really no other place in Charlotte that can compare to The Common Market — live music, cheap beer, healthy vegan and vegetarian eats, groceries, the list goes on. More than anything, though, it’s an amazing place to meet new people. Swing by their flagship spot in Plaza Midwood or their other locations in Oakwold and South End. If you’re looking for an all-around green option, stop by one of the three B.GOOD‘s in town. B.GOOD partners with local farmers—and highlights information about the farmers in each store—so you’ll always know where your food is coming from. Along with that, the menu changes seasonally. So in the summer, their dishes include fresh berries, in the fall, they serve pumpkin and squash. You get the picture. Even their packaging is 100% recyclable. It doesn’t get more eco-friendly than that. Get ready for happy and healthy food. Flower Child is expanding to North Carolina, with its first restaurant coming soon to South End. 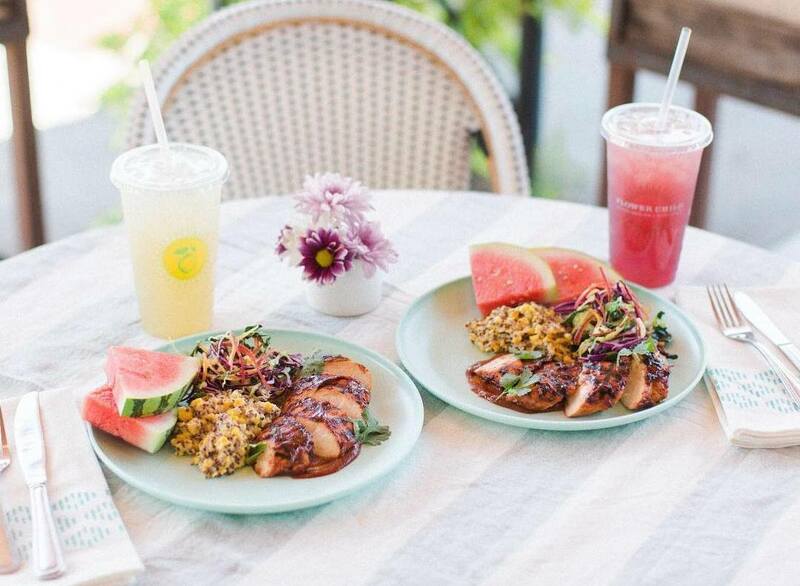 Not only are their salads, wraps, and bowls a feast for your eyes, they taste even better than they look. The best part? Their beverage game is just as strong as their food game, with kombucha and cold brew on tap.